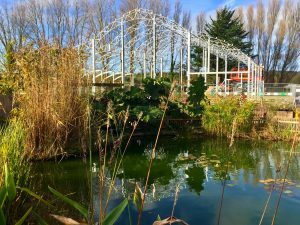 Work is well underway at a Dorset garden centre where a £1 million botanical-style restaurant is a few months away from completion. Malcolm Scott Consultants prepared detailed plans for the structure at Groves Garden Centre in Bridport, ensuring that it boasted an eye-catching design while remaining in-keeping with the Area of Outstanding Natural Beauty it is located in. The restaurant is being constructed by Smiemens Projecten of Holland according to detailed drawings prepared by MSC’s architectural technologist Alexandra Ginés Heiwegen. Malcolm Scott Consultants secured permission for the 176-cover facility and other site developments and had a number of specific considerations to overcome in preparing the concept designs. Chris Primett, of MSC, said: “Groves Garden Centre is located within an Area of Outstanding Natural Beauty, so we had to ensure – and reassure planning officers – that our proposed structure wouldn’t have a negative impact on that. “There were also strict height guidelines in place – the Environment Agency had instructed the centre to raise the internal floor level of its coffee shop to a minimum of 4.3m AOD above the existing ground level – meaning that our final design was going to be tall in order to fulfil those requirements. “In other words, it had to be both eye-catching and sympathetic to its surroundings,” he explained. The finished designs have been created to catch the eyes of the thousands of drivers and passengers travelling along the A35 – located just 10 metres away – and will utilise curved glass panes to complement and reflect the surrounding area. Chris said: “The building is positioned to curve away from the A35 rather than presenting a vertical elevation, and while we would ideally have chosen glass cladding to the roof and sides nearest the A35, the internal use within that particular part of the restaurant; the customer toilets and kitchen, meant that a solid cladding material would be required for that aspect. MSC had used the same concept at a previous centre and were able to demonstrate how effective the end result would be to officers. 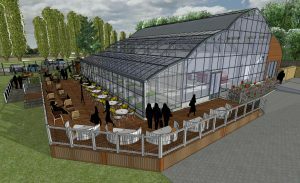 Charlie Groves, of Groves Garden Centre, said: “We’re really pleased with the progress being made at the site now – the restaurant is really coming together and I can see it taking shape as planned. “We were impressed with the plans MSC put forward and now that we can see them being realised on-site, we’re excited to see the completed result. “Catering is a huge revenue stream for garden centres, and with our existing coffee shop being such an important resource for us, we were very keen to enhance our customer offering while being sympathetic to the local surroundings. “We’re satisfied that the finished building will do just that, and be a great attraction for locals when it’s unveiled in May next year,” he added.